The property market in Shanghai seems to be revving up again stoking fears of an impending price rise, going by the record sales price of an apartment in the expensive but much sought after Tomson Riviera. According to data from Shanghai Real Estate Trading Center (SRETC), the 600-sq-m luxury apartment has been sold for a whopping 96.09 million yuan ($13.3 million) - at 160,848 yuan per sq m - a new record for luxury homes. It also represents a 13-percent increase over the February 2007 sale of a similar apartment. 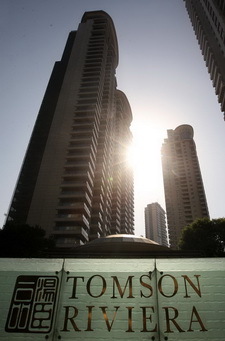 Confirming the development, Li Qing, a manager at Tomson Riviera, said the record price was primarily due to the higher location of the apartment. "This is just a single case and we don't want to elaborate too much on the sale price," said Li, refusing to disclose the buyer's identity. With this, the number of apartments sold in Tomson Riviera has reached 42, according to SRETC data. "Tomson Riviera is just an indicator of the buzz in the Shanghai realty market," said Xue Jianxiong, an analyst from E-House China, hinting that the deal would further push up prices at Tomson Riviera, which until now was witnessing slack sales. According to E-House China, real estate transactions in Shanghai have risen during the past three weeks, with transaction volume of commercial residential housing for this week going up by more than 10 percent over last week. "Foreign buyers are once again expressing their confidence after the nation reported an 8.9-percent growth in its third quarter GDP. Domestic buyers are also buying more realty now as the economy has started to gather steam," said Xue. Indications of this were visible recently when foreign buyers started scouting for property in Greentown Shanghai Rose Garden and purchased four villas for 180 million yuan. Zhao Qiang, an analyst from Everbright Securities, said prices of apartments in Shanghai would continue to rise at least for the next three to six months. "The depreciation of the US dollar may see more foreign funds flowing into the Chinese real estate market," Zhao said. Figures from E-House show that from Nov 2 to Nov 8, a total of 503,600 sq m of residential housing were sold, an increase of 8 percent over the previous week. "Judging from the high transaction volume over the past three weeks, you can find that it is quite close to the figure recorded in June, when the real estate market in Shanghai hit its peak," said Xue. "I think it is time for the government to take effective measures to stabilize the Shanghai market, taking into consideration the recent real estate transactions," he said.